Earlier this week I attend the Ohio Middle Level Association conference with seven people from my building, many who happen to be some of my best friends. We left after school on Wednesday and got home Friday just before dinner. It was a whirlwind trip with lots of laughs, lots of honors, and lots of inspiration. We had some time to catch up with each other beyond the confines of our classroom walls, talk about our personal lives, learn new things about each other, and realize, despite the bad things happening in our schools these days, we still share the same common desire: to engage and relate to middle school kids. Sometimes getting away from the classroom can be just what you need. I am excited to put some new ideas into action and tweak some other ideas to fit my classroom and my personality. One of my friends presented a session called “Just Flip It”. Not only did she do an amazing job of presenting at 8 a.m. on Friday the 13th, she inspired me to try some flipped classroom concepts myself. I guess, somewhere in the back of my mind, I thought “flipping” was only meant for the math classroom. I couldn’t picture flipping anything in Language Arts. I realize now I was wrong. Anytime you have a chance to frontload students, flipping is an option. -Start with someone else’s videos. Yesterday I sat down and made 6 short videos (the longest is 3:23 minutes) for my 7th grade Resource Room Language Arts class. The videos introduce the 6 Notice and Note Signposts. I did start with some YouTube videos I found here, but having students who struggle with reading, I added a voiceover, and I included some of my own material to match what I already have created in my classroom, which you can see here. I probably spent an hour making the videos and the accompanying handout, and each video was a little easier and faster to make. If you’d like to know more about flipping the classroom, I am sure my friend wouldn’t mind sharing her presentation. I also attended a session called “Strategies to Revitalize and Energize Your Classroom.” The two presenters were so similar in personality to me, and I enjoyed every moment of their presentation. I am now searching for a perfect cube-shaped box, so I can make a “Team Challenge Cube.” Just imagine students bringing their agenda, their book, a pencil and their homework to class everyday, and never needing to give that lecture! Look for a future blog post about my experience with The Cube. Click here for contact information for both presentations. Sometimes you can be your own inspiration. When you get just enough confidence and believe in yourself, when you put yourself out there in a new situation…it’s exhilarating. My principal asked me to write a proposal for a presentation at this conference, and I did just that. My presentation was posted here on the blog a few days ago, so many of you may have already taken a look. I was incredibly nervous and my mouth felt like it was full of cotton balls, but I did it. I gave a 45-minute presentation on something I am passionate about: writing. My friends said I did great; I have to take their word for it. I remember very little, but I am so glad I took the risk and had the opportunity to present. It may not have been perfect, or completely how I envisioned it, but it was a learning experience and something I look forward to doing again. So where does the apple come in? (This is where I brag a little.) 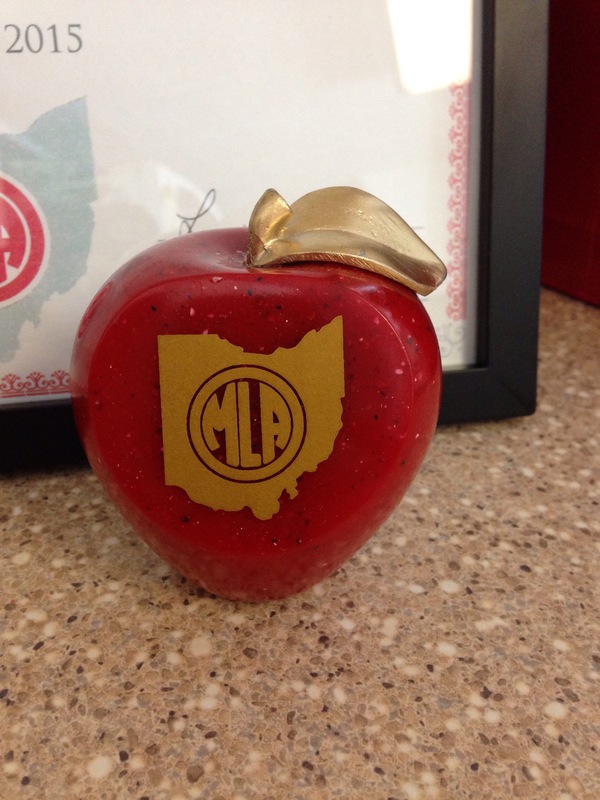 On Thursday night, following a social hour with some of Ohio’s top middle school teachers, I received the Ohio Middle Level Association East Regional Award for Best Middle Level Practice. Nominated by my administration, primarily for my experience with author Rick Niece, I received a certificate and an apple. Oh, and this special ribbon to add to my name tag. The thing about it all, the reality…I could not have won that award without my 21 students. They were there with me every step of the way. They were the reason I stood in my driveway and made the call to Rick Niece in the first place. They were the reason I won this award. Everything I’ve done this year, I’ve done for them. Without them, I wouldn’t have this apple. Congrats on your apple award! I, too, am intrigued with the concept of a flipped classroom. However, with taking on new teaching assignments this school year, I am learning the new curricula and have not been dedicated to this topic as I would like to be. I would greatly appreciate the information you received at your conference; including the cube as well. My reading class is reading “Side Yard Super Hero” now. Wow! I am learning so much about my students and their thoughts. I am utilizing Edmodo for journal prompts. Students then are required to also reply to their classmates responses. I am so impressed at their thought processes! Thank-you so very much for sharing all of your wonderful ideas. I love your blog. Have a good one. Thank you! I am going to send you an email with the info you requested. I appreciate your feedback and am glad you have found my blog useful!